As we all know by now the Sonic Screwdriver like the one Doctor Who has is an real handy piece of equipment. And now there is a key chain version of the Sonic Screwdriver that is used by the 11th Doctor. And this also seems to be the same Sonic Screwdriver Doctor number 12 uses. OK this key chain is nothing more then a real great looking piece as the Sonic Screwdriver does not actually work. Besides being great to have hanging beside your keys this Sonic Screwdriver will bring back memories of Doctor number 11 and his funny quirks. So if you want to be able to make your friends believe you can fix problems with you key chain then you just have to order this Doctor Who 12th Doctor Sonic Screwdriver Key Chain. There we have a little baby Adipose. This one still has to fatten up a bit but then it can be a big Adipose. This 4″ tall plush Adipose is has a clip on it so that you can hang it on all kind of things from your keys (as a key chain) or on your jacket and maybe a backpack. Anything with a loop is a good home for this Adipose plush. And the fun part of this Adipose is that it has sound effect straight out of the Doctor Who TV series so you know it’s the real deal. Give this fat eater a new home! 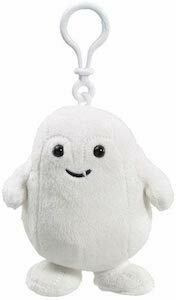 So come and adopt your own Doctor Who Adipose 4″ Plush Key Chain. 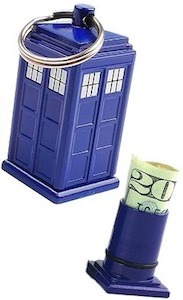 Doctor Who fans can now leave their wallets at home as this Tardis key chain will store you money for you. It’s a fun key chain shaped like the famous Tardis and inside is a secret compartment that has room to store paper money. Of course a wallet will still be handy but now you can have an emergency fund ready to use right there on your key chain. I am sure the Doctor will think that this is pretty clever. Now you never have to worry about if you took you wallet or not as there will be money on you key chain. Come have a closer look at this Doctor Who Tardis Emergency Fund Key Chain. Do you want a multifunctional Tardis key chain? This Doctor Who key chain can be that as it is not just a key chain it’s also a USB flash drive that can hold up to 4gb of data. Files, photo, video’s and more can be stored on this flash drive. And the fun part is that this flash drive looks like the Tardis. Normally it looks like you have a little Tardis on your key chain but when you pull the top off you find a USB connector and then your Tardis became a storage device. Of course this Doctor Who Tardis flash drive is not so smart as the real Tardis but it still can hold a lot of information about the universe. 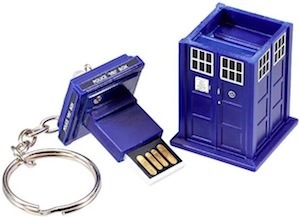 Lets keep our data safe on this Doctor Who Tardis USB Flash Drive. Those Doctors all have their funny things they say and as you may remember the 10th Doctor would like to say Allons-y. 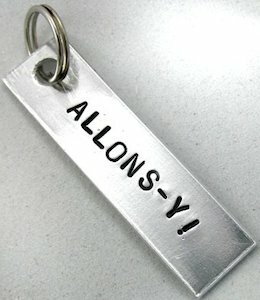 Now you can have an amazing key chain that says “Allons-y!” just like the Doctor said it. And this key chain is made from aluminium with hand stamped letters making each one different and unique. Of course this key chain is great for your Tardis, car or bike as Allons-y means lets go and to go you could use a means of transportation. Give those keys a special friend with this Doctor Who Allons-y Key Chain. 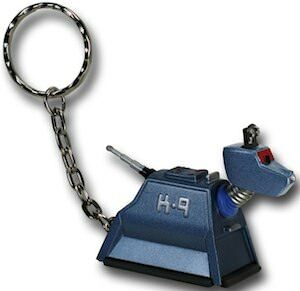 Are you a Doctor Who fan that does not have a Doctor Who related key chain yet? If so then you should check out this rubber Tardis key chain. This key chain is kinda flat and on but it may be bigger on the inside. And the key chain is shaped like the police box that Doctor Who uses to travel in time and space. The Tardis key chain is 2 x 3 inch and is made from a rubber material. Just imagine your keys hanging together with a little Tardis. Or how about using this Tardis key chain as decoration on your backpack. From what ever angle you look at it the answer is the same…. check out this Doctor Who Tardis Key Chain. Do you like to have a Tardis in your pocket? If you do then you are gone love this Tardis key chain. And it’s not just a little blue box that lives with you keys. This Tardis key chain has a build in flashlight to bring light to the darkness. I am sure that Doctor Who would love to have one of those for when he can’t find the real Tardis. This Tardis key chain is about 1.5 inch tall and makes a great companion for your keys and would also look great just dangling on a backpack or jacket. Let the Tardis bring light to the darkness with this Doctor Who Tardis Flashlight Key Chain. Having a flashlight with you could be handy when it is dark and now you can have one as you key chain. 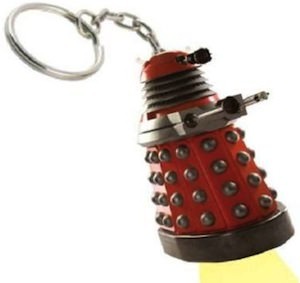 This flashlight key chain looks like a Dalek one of the enemies of Doctor Who but no worries this red Dalek will be secure to your keys so it will not try to EXTERMINATE anything while living close to your keys. Maybe the Doctor should get one to so that he can have his Tardis key hang on it. The Dalek key chain is about 2.5 inch long and has a LED flashlight build in so you get two Doctor Who items for the price of one. Come and have a closer look at this Doctor Who Red Dalek Key Chain And Flashlight. A Doctor Who fan of course wants a Sonic Screwdriver and a real one is hard to get but this screwdriver looks like the one the 10th Doctor uses. It is 3.5 inch long and is a key chain with a build in torch. So now you can have your keys live with a Sonic Screwdriver and of course you don’t have to use it as a key chain. You can hang it on your purse, backpack or maybe use it as zipper pull for you jacket. Thanks to the Doctor you don’t have to stand in the dark any more either because of the build in blue flashlight. What do you think? I think I really want one. If you do to then come check out this Doctor Who Sonic Screwdriver Key Chain And Flashlight.